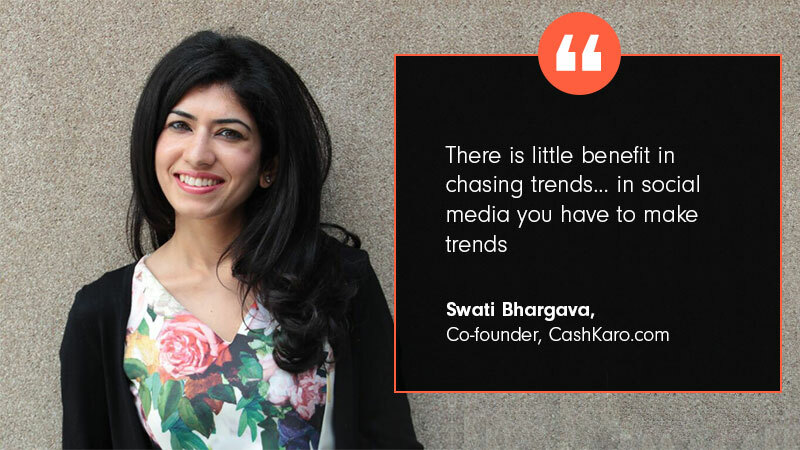 Swati Bhargava, Co-founder, CashKaro.com shares 7 integral social media marketing lessons from the brand’s journey in 2017. Executing a successful social media marketing strategy requires remarkable planning and well-timed implementation. Unprecedented growth in the impact and reach of social media campaigns has made many shift their focus. Let me share some insights from CashKaro’s brand building story. As a young business we used to drive 20% of our traffic through Facebook and our initial social media campaigns made people aware of our USP. They became familiar with our website, the brands and retailers we partner with – all perennial goals for us. Keeping that focus alive, we post deals, contests and other engagement driving contentwith our users every single day. A consistent approach to social media marketing has helped grow our combined Social Media fan base to over 10 Lakhin a short span of time, with a reach of 10 million views each quarter. However, genuine, organic engagement is difficult to reap and the subtlety with which one has to weave in the brand can be truly daunting. My team and I have faced these challenges and I’m going to share some of my learnings with you – so you don’t have to go through the uncertainty we did. Before you start thinking of your social media plan – you must always have a clear objective in mind. Will this campaign push sales? Will it drive engagement? How will you measure its impact? What’s the goal you hope to achieve? Ask as many questions as possible and answer as many of them as you can before you even begin work. Lay a strong foundation because without it even the best social media experts can’t help you. Let’s take an example; we wanted to talk about Jabong’s Diwali offer on CashKaro. So, we did a Facebook live where I spoke about my personal shopping experience, showing a jacket I had bought using the deal. This got us a lot of traction, on Facebook meeting our objective of spreading the word and translated into direct traffic for our website. I know you’ve heard this a zillion times but what does it mean? In my view, a ‘less is more’ strategy should be adopted for content. Attention is scarce and people don’t have the time to absorb too much. High quality, easy to grasp content is the only way to go for social media (and in my view for everything else as well). In line with that approach we do short videos with different people explaining the best deal we have every single day. These videos get us relevant traffic – since users already understand what the deal is and how they can get it. There is little benefit in chasing trends… in social media you have to make trends. Not to say that you can’t react to trends in real-time and cash in on them. That is always low hanging fruit but, you must also spur trends that can shape your content’s reputation. Identify your niche and talk to a specific audience in the tone they understand. It can even be something topical, like the Anti-pollution mask campaign we at CashKaro did. We donated free anti-pollution masks to all security personal, auto rickshaw drivers etc. in and around Sector 44 Gurgaon. We managed to win a lot of smiles and some engagement on our timeline along the way. There are many social media platforms today – you don’t have to master them all. Identify the ones that work for your brand and use them wisely. Different platforms serve different purposes. LinkedIn is great for making new business connections with partners, journalists and even to connect with customers. Snapchat and Instagram are great if you are selling products. We extensively use Facebook Live and Instagram Stories to show online shoppers how they can earn Cashback through CashKaro.com. I personally use Twitter a lot to interact with CashKaro customers and take their feedback on our product enhancement and launches. The right mix of content is more important than anything else. Unlike pages that only aspire to gain ‘Likes’ and ‘Shares’ your objective is to spread the word about your brand. So, while a few memes are great, you can’t crowd your timeline with just them. Variety adds flavour, so sit your team down and put your content plan on an excel sheet. Consistently good content will take you further than one great post a month. Our Children’s Day photo contest and #HowCashKaroWorks Video Contest on Twitter and Facebook are fine examples of this. It added a different appeal to our timelines where people actively participated, causing a peak in engagement. If your page is live; more people are likely to see it. This is simply because it gets ranked higher by Google’s algorithm. This is also why online marketers should use live video streaming. Moreover, live videos are watched for upto three times longer than pre-recorded videos. People like seeing things in real-time so why not make use of it? The AMAsI did on Reddit& YourStory and even my husband and Co-Founder Rohan’s Facebook Live AMA did just that. They invited a lot of engagement, reinforced brand recall and helped us address misconceptions about the Cashback industry. Encourage conversations about your brand – make influencers try your product and encourage them to post about it. Potential customers are more likely to listen to these individuals than you.Let influencers speak their mind; accept criticism with as much grace as you accept applause. Another thing to remember is that a little goes a long way with such endeavours. For example, we invited a lot of bloggers to our office last year for a small meet and greet. It helped us understand what their content is about and they learned about CashKaro. Some of these bloggers later wrote about CashKaro on their social channels, spurring conversations about the brand. So, that was my list of social media lessons from 2017. I am confident that ingraining these seven industry best practices into your social media approach will help you reap results. Go on, try different things, experiment and don’t forget to have fun!